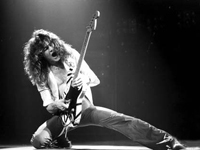 Second to only Jimi Hendrix, Eddie Van Halen was undoubtedly one of the most influential, original, and talented rock guitarists of the 20th century. Born Edward Lodewijk Van Halen on January 26, 1955, in the Netherlands, Van Halen moved with his family to the U.S. in the ’60s. He and his older brother, Alex, began taking piano lessons at an early age, which planted the seeds for both of the siblings’ future musical career. Mesmerized by the British Invasion rock movement (especially the Dave Clark Five), Eddie began playing the drums, while Alex took up guitar. The brothers switched their respective instruments shortly thereafter (while Eddie was out working a paper route trying to make his drum kit’s payments, Alex was bashing away at his drums, until he was actually better than Eddie) — as such, hard rock guitarists as Eric Clapton and Jimmy Page soon influenced the youngest Van Halen’s playing. The Van Halen brothers began playing backyard parties and clubs in the Los Angeles area (mixing covers with originals), and eventually hooked up with singer David Lee Roth and bassist Michael Anthony in the early ’70s, as the group Mammoth. It was around this time that Eddie began employing a new skill to his guitar playing, the ‘two-handed tap’ technique, which would soon become his trademark (and infinitely copied by other players). With his awesome speed and tasty phrasing, Eddie quickly became the top guitarist on the local music scene, as the group changed their name by the mid-’70s to simply Van Halen. Eddie also began custom building his own guitars, while using the shape of a Fender Stratocaster, he would cover the body of his guitar in strips of tape to create a wild design that would become another trademark of his. Van Halen signed to Warner Bros. in 1977, which issued the band’s classic self-titled debut a year later, starting off a string of multi-platinum albums and sold out tours. Ed immediately began being recognized as the best rock guitarist, he won numerous poll awards from all the world’s guitar magazines (Guitar Player, Guitar World, etc. ), something that would become a yearly occurrence. Besides guitar, Ed broadened his horizons by adding keyboards to the band’s sound (resulting in their 1984 number one hit “Jump”), as well as singing lead on select tracks (1998′s “How Many Say I”). And despite going through several singers throughout their career (Roth, Sammy Hagar, and Gary Cherone), Van Halen‘s popularity persevered. In addition to playing on Van Halen albums, Ed has also appeared on other artist’s recordings — his most famous being an uncredited solo on Michael Jackson‘s 1983 monster hit, “Beat It,” as well as collaborations with Queen‘s Brian May (1983′s Star Fleet Project) and Roger Waters (the track “Lost Boys Calling” from 1999′s The Legend of 1900 soundtrack). Film scoring also was added to his list of credentials, with his compositions appearing on the soundtracks for the movies The Wild Life (1985) and Twister (1996).